While most of us likely keep an eye on the ingredients we put on our faces, girls with sensitive skin will know the importance of choosing soothing, calming products for our bodies as well. When you've got itchy, red, or inflamed skin to contend with, avoiding chemical-laden lotions and heavily perfumed body scrubs isn't a just a preference but a necessity. If this sounds like you, we sympathize, which is why we've rounded up a few tried-and-true sensitive skin–friendly bodywash picks. After all, keeping your skin freshly scrubbed is the first step in any well-rounded bodycare regimen. These 14 formulas were sourced from far and wide, and real customers say they're effective at cleansing the skin without making it angry. 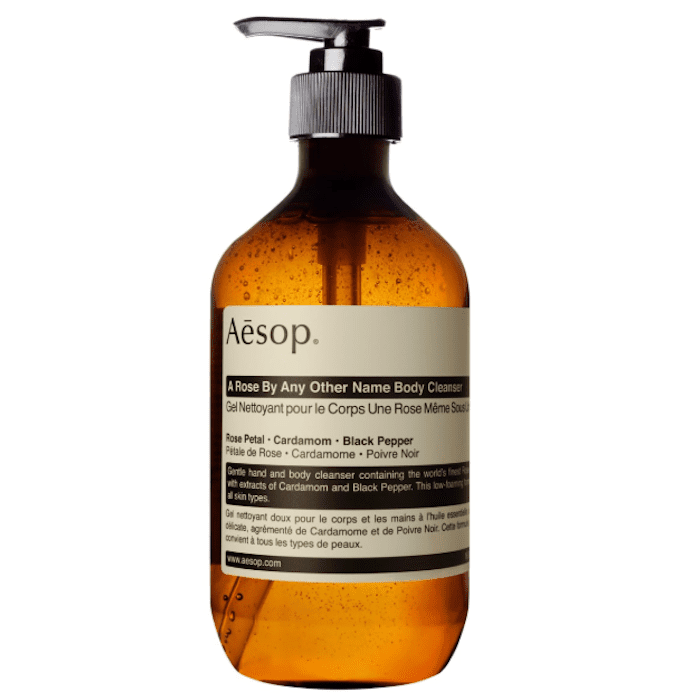 Aesop is a favorite among clean-beauty enthusiasts—just take one step into its clean, minimalistic brick-and-mortar stores and you'll see why. Its products are effortless, paired-back, and effective, yet also kind of decadent. We know that doesn't make sense, but hopefully this bodywash clears things up. Its rose scent is light and lovely, and the formula is gentle and hydrating. Take it from the reviews, which are overwhelmingly positive: "This is such a brilliant product; you can see results from the first use. It is really gentle and hydrating, and little goes a long way, so the price is actually good for the amount you get. As a bonus, the smell is absolutely lovely. A must-have!" 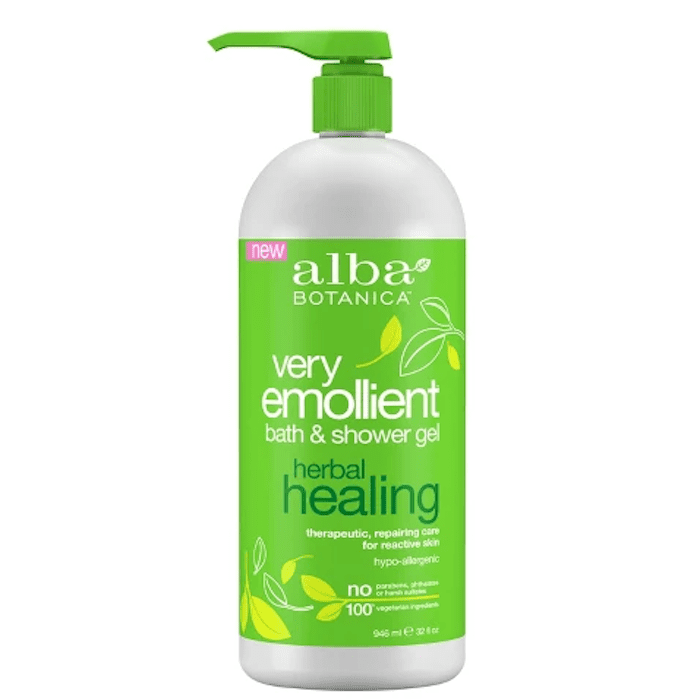 As for a drugstore pick, you can't go wrong with this Alba Botanica shower gel. The affordable pick has oatmeal, turmeric, and antioxidants to soothe skin and calm inflammation—no parabens, pthalates, harsh sulfates, artificial colors, or synthetic fragrances. Just listen to this glowing review: "I have extremely dry, sensitive skin due to atopic dermatitis. I'm not exaggerating when I say that this is the BEST bodywash I've ever used. … It's hydrating, it doesn't strip my skin of its natural oils (which is a first for me), and it doesn't irritate my eczema at all." 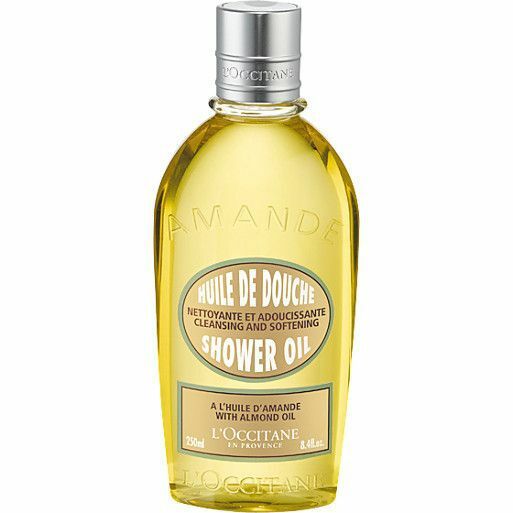 If luxuriousness is a main selling point for you, try this cult-favorite cleansing oil from French company L'Occitane. It transforms from an oil to a milky texture as you rub it between your hands, working to soften, smooth, and moisturize the skin. If your main concern is dryness, this one might be for you. One Sephora reviewer writes, "My itchy, dry skin got some relief. This way I get moisturized without any outside help, and it smells wonderfully mild and calming, not perfume-y." 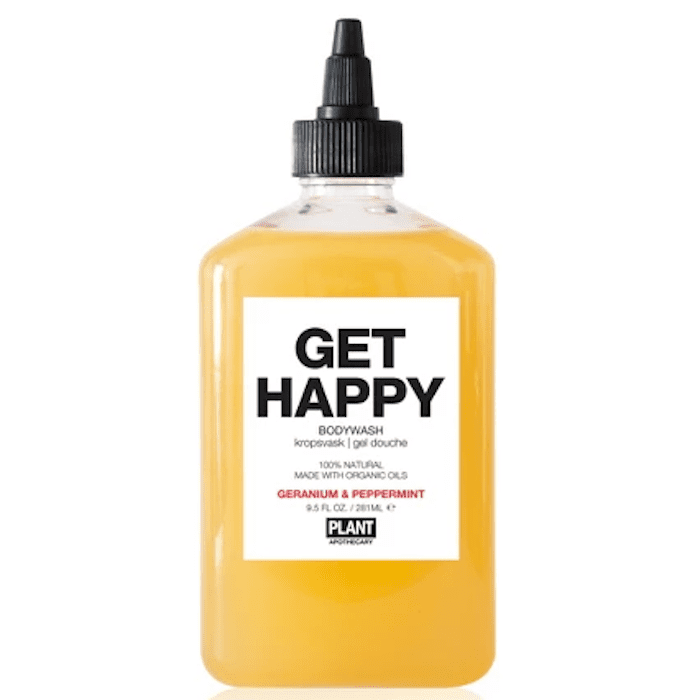 The name of this bodywash is Get Happy, and rest assured, there isn't a more happier scent out there. The geranium and peppermint awaken, enliven, and uplift, which is why it's best for morning shower people (at least we think so). The best part is that it's literally made with only eight ingredients—that's it. "All the Plant Apothecary scents are excellent, and their bodywashes seem the most pure of all the bodywashes I've looked at—no fragrance listed at all—just the scents from the plants used. Very short ingredient list, which is also a plus." 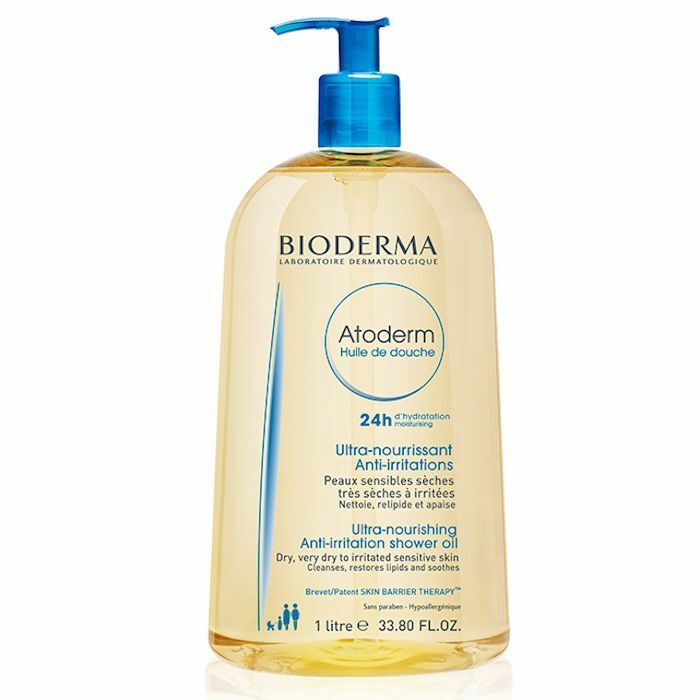 Bioderma's shower oil is specifically formulated for use on sensitive skin. It's ultra-moisturizing and smoothing, and promises to leave skin feeling comfortable and soft for upward of 24 hours (which means it's comparable to the aforementioned L'Occitane product). "This cleanses my skin without stripping it of moisture," one reviewer says. "Perfect for winter, especially if you have dry skin." Rahua's shower gel is clean beauty–certified at Sephora—it's vegan, cruelty-free, and made with USDA-certified organic ingredients. We love its scent, which is equal parts earthy and floral thanks to essences of lavender, eucalyptus, vanilla, and palo santo. "This shower gel is great for sensitive skin. [...] It lathers nicely and is moisturizing. It helps to sooth my skin by not drying it out. I wish more companies would make products without SLS," says one Sephora customer. 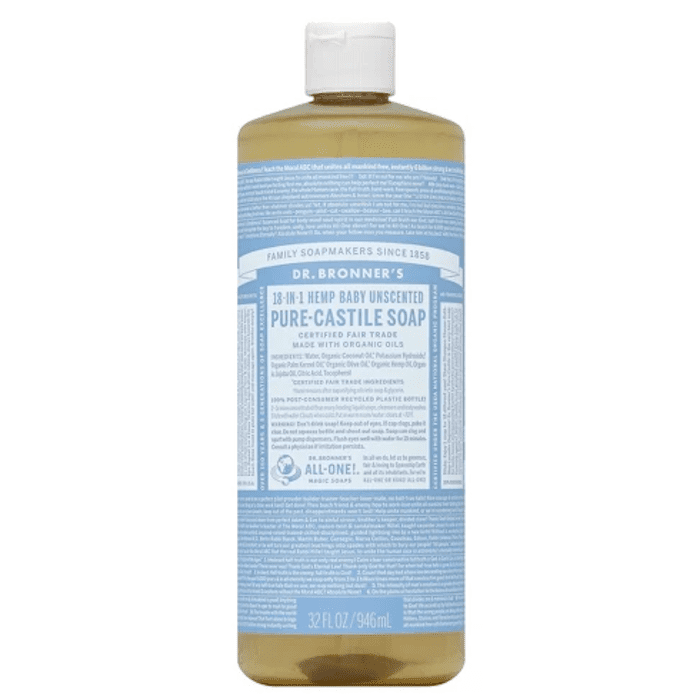 Dr. Bronner's Castile soap is one of my secret weapons. I rarely talk about it, but I've been a loyal fan since I first tried it all the way back in high school. I use it every single day, without fail, as a bodywash (and sometimes as a face wash too). While I initially fell in love with Peppermint Castile Soap ($11), I've found the unscented version to be much more gentle on my sensitive skin. It thoroughly cleanses without stripping or irritating my skin, and it's made with good-for-skin, fair-trade ingredients. 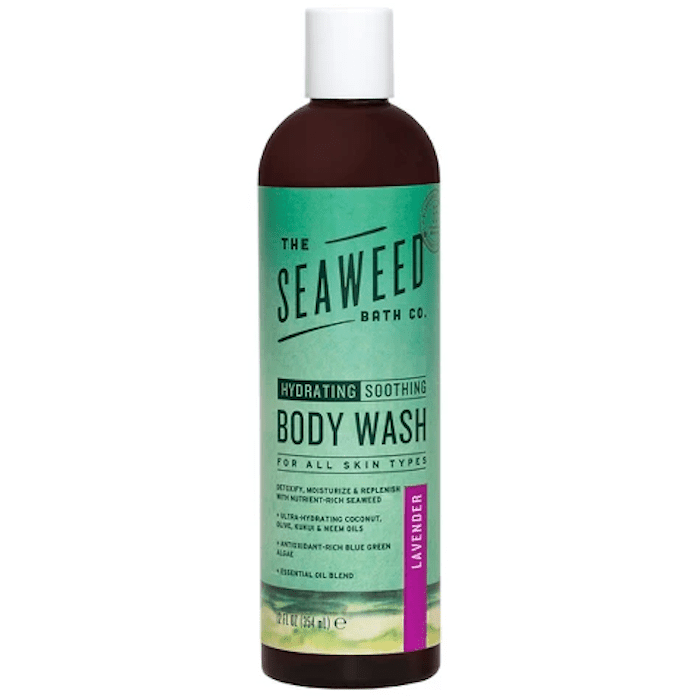 The Seaweed Co.'s bodywash is organic, packaged in 100% recycled plastic, and bursting with 65 vitamins and minerals. It's one of my go-to bodywashes (and has been for a minute). "I never had outrageous skin conditions, but I always experienced unpleasant dryness and irritation from using bodywash, especially in sensitive areas and for shaving," says one reviewer. "I've been using Seaweed Bath Co. bodywash … for a couple years now, and I NEVER have dryness or irritation that way any more, even if I forget to moisturize after shaving." K-beauty brand Too Cool for School is responsible for this moisturizing bodywash. It's good for all skin types and uses coconut to nourish from head to toe. "My skin is very sensitive," writes another happy reviewer. "I have eczema and have to use boring cleansers with lots of moisturizers and use lotion when I get out of the shower. I bought this on a whim because it was on sale, and I was not disappointed. 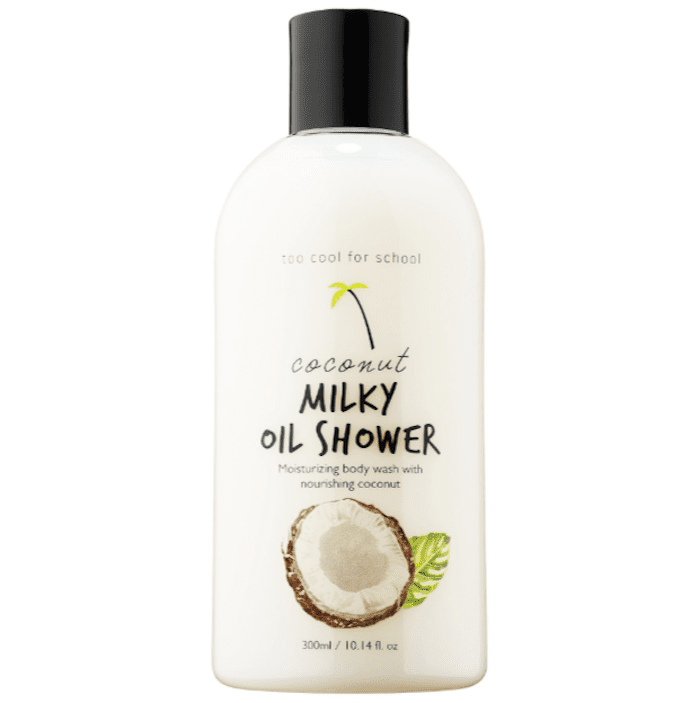 The scent is a mild coconut—not too sweet like candy. I felt clean without feeling like my natural oils were stripped away. My skin was soft and dewy after using it." This bodywash is organic and made with a small number of wholesome ingredients we can actually pronounce, like jojoba oil, aloe, honey, and various essential oils (which sounds lovely, no?). "Great product," says one reviewer. "Love this wash. Gentle and lovely fragrance with safe ingredients." If the brand name doesn't tell you already, the ingredient list will. 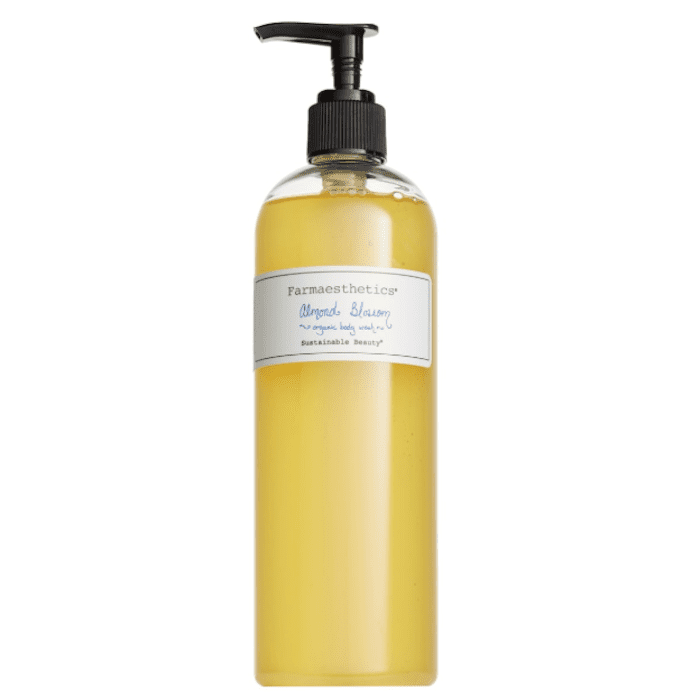 This shower gel is formulated without harsh chemicals that can irritate the skin. Instead, it uses eucalyptus, green tea, and seaweed to to refresh, hydrate, and soothe. It's the perfect option for a summertime bodywash. "I bought this for a friend who can't get enough eucalyptus! She loved everything about the gel- the packaging, the scent, and the clean feeling with no after-shower dryness," says one customer. Weleda is the same company that makes the cult-favorite moisturizer celebrities like Rihanna, Adele, and Victoria Beckham swear by. This sensitive skin–friendly body wash uses organic almond oil, along with other mild plant-derived ingredients to cleanse without stripping. "I love this new bodywash! The scent is delightful, and it doesn't irritate my skin." 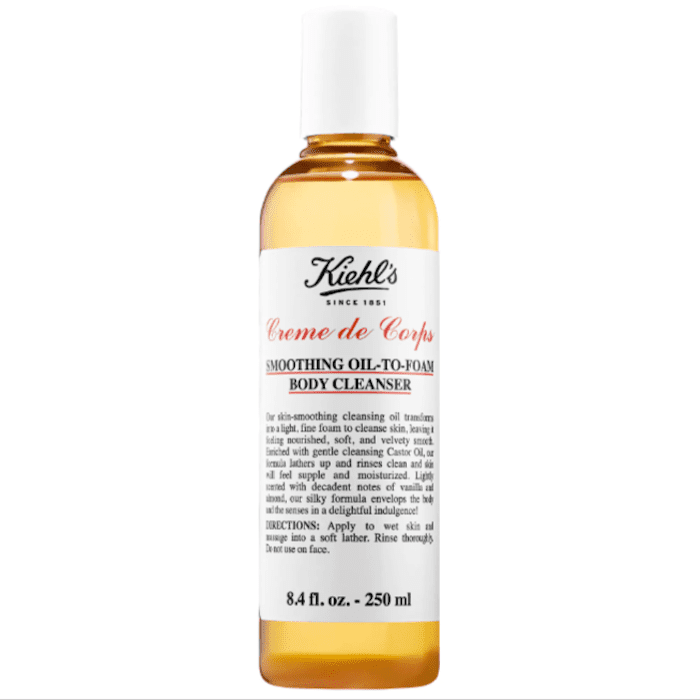 This Kiehl's product is another cult favorite. What starts out as a moisturizing oil slowly transforms to a sudsy foam as you rub it into your skin. One of the key ingredients is castor oil, which is known for its super-moisturizing properties. "This is such a great body wash for the autumn/winter months," writes one customer. "It has a nice scent—not overpowering at all. And it left my skin feeling soft and eased my itching due to dry skin. I highly recommend this. My skin had a sweet, mellow scent." Now that you know about the internet's favorite gentle bodywashes, read all about how you can tailor the rest of your skincare routine to fit your sensitive-skin needs.